PDXpert software is licensed for a specified number of named user accounts. A named user account is a unique log-in username that is assigned exclusively to one person, and which no other person may use. A workgroup may share a named user account to look up product data on a kiosk computer. The kiosk uses a read-only user account on a single computer at a specified physical location. If you follow the rules (see below), then for licensing purposes you may count the kiosk computer as one person, regardless of how many actual people use the kiosk computer. A PDXpert software license may not be used with more than one server computer. The PDXpert client may not be used to provide concurrent, shared, floating, enterprise, site or other non-exclusive user access. A full-function named user account permits users to create new part, document and change records; add file attachments to the system library; review, comment on, and approve change forms; and configure the system through the administrator role. You can easily select (and edit) which permissions are applied to each user account by assigning the user an appropriate role from the Roles collection. A read-only named user account allows a user to view - but not add or change - data records and attached files. Whenever you wish, you can reassign a full-function license to a read-only user, and vice versa. You can also delete one person's log-in account and reassign that license to a different person. If desired, you can assign a read-only role to a user with a full-function license, and that license will act identically to a read-only license. If the number of log-in accounts exceeds the maximum permitted by your license, then only the super administrator account is permitted to log into PDXpert. Use the Super Admin account to remove any excess log-in accounts. To manage user accounts, you must be assigned an administrator role. An administrator role is one that has its Rules/Collections: Manage checkbox marked. See the Roles collection reference for details. The system's super administrator always has permissions to create and remove user accounts. Any change that you make to a user's account may not take effect until after that user closes the PDXpert client. A user account is licensed for the exclusive use of one person. The new user account has a role, a username and an optional password, and the default set of user preferences. A new user account row is displayed when (1) unused licenses are available, and (2) a Persons collection member doesn't yet have a user account. In the Access column, select whether you are assigning a Full-function or Read-only user account. The total number of licensed user accounts is specified by your PDXpert software license. To open the Software License Key dialog, select the Software License Key... command from the Tools menu. In the Person column, select the person whom you want to have a user account. If you don't see the person in the list, (1) close this User Management window, (2) create a new person record in the Persons collection, in the Collection Explorer (Places/Organization/Persons > Persons), and (3) re-open the User Management window. Include the person's email address — when the user account is created, an email is sent to the person with the account name and PDXpert client download link. In the Role column, select the set of permissions that a user will have within PDXpert. Roles are created and modified in the Roles collection. If you don't see the desired role in the list, (1) close this User Management window, (2) create a new role record in the Roles collection, in the Collection Explorer (Places/Organization/Persons > Roles), and (3) re-open the User Management window. Enter the Account name that the person should use for the log-in dialog. The log-in name is not case-sensitive: LEE and lee refer to the same user. The PDXpert server (not client) computer sends the user's credentials for LDAP authentication, and must join the LDAP domain. PDXpert uses the default Windows .NET protocol: username and password are encrypted using Kerberos ("sealing"), and data integrity is verified ("signing"). This username is used only for account log-in. Within the PDXpert application, the user is identified by the Persons member record. Assign an account name that's clearly related to the person's name. It's difficult to manage software license compliance using a generic account name like quality. If you wish, enter the Password that the person should use for the log-in dialog. Although a user's password is case-sensitive, this temporary password does not need to meet the requirements you specify in the Password policy system rule. For example, you can provide the user with a blank temporary password even though you specify a minimum password length. If you're using LDAP to authenticate the user, this password is not used and can be left blank. The password value is hidden after you create the account. In the Action column, click the Create button to save the new user account. Your user may now log into PDXpert using the account name and password you've assigned. A kiosk account provides read-only access to any number of people in a workgroup on one physical computer. The new kiosk account must have read-only access and an account username that begins with kiosk… characters. Create a new member in the Persons collection using the kiosk computer's network name, such as SERVICE02. If necessary, close the User Management window, create the member, and then re-open the User Management window. In the Access column, select the Read-only user account. If you don't see a Read-only user account, you can select a Full-function user account. The role that you select in Step 4 (below) must have the Restrict access to read-only checkbox marked. In the Person column, select the kiosk computer's name that you created in Step 1. In the Role column, select the set of viewing permissions that kiosk users will have within PDXpert. Enter the Account name that kiosk users should enter for the log-in dialog. The username must begin with kiosk, such as kiosk2 or kiosk-service. If you wish, enter the Password that the person should use for the log-in dialog. The password should meet the requirements you specify in the Password policy system rule. The system's super administrator handles unusual situations: the PDXpert Server can reset this user's password, and this user can reduce user accounts to comply with the license. See the Collections reference > Places/Organizations/Persons > Persons: Default member of collection help topic. In the Collection Explorer, go to the Persons collection (within the Places/Organizations/Persons group). Select the person who will be assigned the super administrator permissions. This person must have a user account with full-function access. Right-click the person's name in the list, and select Set as Super Admin on the context menu. You can assign a user a different role, reset a log-in password, and modify an out of office agent. To assign a current user a new role, select the role from the dropdown list box in the Role column. The value is saved immediately. To reset (clear) a forgotten password from the user account, click on the ✕ button at the password textbox. You can leave the password blank, or enter a new password and then click the ✓ button to save it. The password value is hidden before you clear it, and immediately after you save a new password. To add or modify a user's out of office agent, select the agent from the dropdown list box in the Agent column. Only persons with a full-function user account are listed. To remove a user's assigned agent, select the blank value from the dropdown list. Your selection is saved immediately. The system identifies a user account by its account access and assigned account name. To change a user's access, the system must build a new user account using the new Access value. To remove the existing access and free the log-in name, delete the existing user account. The system identifies a user account by its account access and assigned account name. To change a user account log-in name, the system must build a new user account using the new Account name. To remove the existing user account log-in name, delete the existing user account. Deleting a user account eliminates the person's ability to log into PDXpert and frees one license, making it available for reassignment to another person. To remove a person's log-in credentials and release the license, click the Delete button on the appropriate row. Deleting a user account deletes that person's user preferences. If you create a new account for that person, then preferences (such as Enable local views and Out of office agent) are assigned their default values, and must be reviewed. If the person is currently assigned as the super administrator, a different person must be set as the super administrator before the account can be deleted. 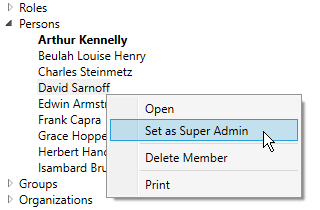 In the Persons collection, select the name of the new super administrator, right-click to open the context menu, and select the Set as Super Admin command. When an employee leaves your PDXpert system, you'll typically delete the user account but retain the person's record for historical accuracy. See Setting a person's status to inactive in the help topic Collections reference > Places/Organizations/Persons > Persons. If the former user has selected an out of office agent, deleting the user account also removes the agent's permissions to the user's items and tasks. If you wish, you can temporarily specify an agent to take control of the previous user's in-process items. During this period, it's possible to assign a read-only license to the former user, then set the agent; the agent needs a full-function license.